The MLB Season has begun and teams are getting ready to compete for a chance at the World Series title. Tampa Bay Rays: Last year, the Tampa Bay Rays stunned MLB fans around the world. In a very tough and competitive division, the Rays placed third but still managed to win 90 games and stay above .500 by 18 games. In 2019, the Rays enter the year with high expectations. One of the players the Rays are looking for to be consistent is AL Cy Young Award winner Blake Snell. Blake Snell was a breakout star for the Rays and has been an underdog pitcher in the AL being undermine by Justin Verlander, Chris Sale, Gerrit Cole, and Luis Severino. The Ray’s front office extended Snell’s contract to 5 years/ $50,000,000 guaranteed. The Rays began Opening Week beating the Houston Astros in 3 out of a 4 game series and beat the Colorado Rockies in 2 out of a three game series. Some players to keep an eye out this year in Tampa Bay are the fireball reliever Jose Alvarado, the acrobatic Center-Fielder Kevin Kiermaier, power hitting Catcher Mike Zunino, veteran Starting Pitcher Charlie Morton, and the versatile Outfielder Tommy Pham. The Tampa Bay Rays are a dark horse candidate to win the tough division or possibly make a run at a spot in the wildcard. Baltimore Orioles: 2018 is a year the Baltimore Orioles would like to forget. The Orioles made history in having the most losses in a single season. Their record last season was 47-115, being one of the most disappointing years after losing Manny Machado and losing Adam Jones this offseason to the Diamondbacks. After losing these pieces, their face of the franchise has become Chris Davis. Chris Davis is coming off one of his worst years ever batting .168 and starting off 2019 0 for 21 with 11 strikeouts and his last hit being September 14th, 2018. In 2016, the Orioles extended Davis’ contract to a 7 year/ $161M contract and Baltimore fans are full of rage with the future’s outcome. The Baltimore Orioles began 2019 catching the league by surprise by winning a 2 of the 3 games against the Yankees and winning 2 games of the 3 game series in Toronto. Baltimore’s early success in the year will not last for long. Some of the success to look for in Baltimore are Right Fielder Trey Mancini, Reliever Mychal Givens, Second Baseman Jonathan Villar, and Left Fielder Dwight Smith Jr. What makes the Baltimore Orioles terrible is their starting pitching staff and their injury prone players. The Baltimore Orioles look to have a bounceback season and attempt to finish above .500 with no vision of making the playoffs. Boston Red Sox: The reigning World Series Champions. Everyday in 2018 you would turn on ESPN or MLB Network and there would always be a Boston Red Sox highlight in their broadcast. The Boston Red Sox had a memorable 2018 and look to repeat their success this year. One of the key pieces on the roster has been AL MVP Award winner Mookie Betts. Mookie has been the most consistent hitter on the team along with J.D Martinez. The beginning of 2019 has not started off to what Boston had in mind. The Red Sox are currently sitting at 2-7 with a rough start to the year. Although this detriment beginning will not last for long time. About this time last year, the Red Sox began similar to this season and eventually went onto winning the 2018 World Series. The entire Red Sox active roster is impressive but here are some names to keep tabs on for the Boston Red Sox are, Outfielder/Second Baseman Mookie Betts, Designated Hitter J.D. Martinez, Starting Pitchers Chris Sale and David Price, Outfielder Andrew Benintendi, First Baseman Mitch Moreland, and World Series MVP Steve Pearce. The Boston Red Sox are one of the best teams in the American League and look to repeat their pastime. New York Yankees: The New York Yankees ended their 2018 season disappointingly by losing to their interleague rival Boston Red Sox in the ALDS. Although not ending their year the way they hoped for, the Yankees were very impressive and showed their versatility in the roster. Three youngsters to look forward to see in pinstripes for 2019 will be Luke Voit, Gleyber Torres, and Miguel Andujar. These three players helped the team in 2018, but this year viewers will watch them evolve into beasts. Keeping up with the trend, the 2019 season for the Yankees has been terrible. The Yankees lost most of their roster to injury. The injuries consist of breakout star Aaron Hicks, former All Star Troy Tulowitzki, veteran Pitcher CC Sabathia, Bronx Bomber Giancarlo Stanton, star Shortstop Didi Gregorius, and their flamethrowing ace Luis Severino. The 2019 offseason was a success for the Yankees by acquiring James Paxton and signing D.J. LeMahieu and Adam Ottavino. Despite the many injuries, the Yankees will be amazing. Some names to look forward this year are, the trio Bronx Bombers Aaron Judge, Gary Sanchez, and Giancarlo Stanton, Baby Bombers Gleyber Torres and Miguel Andujar, and lastly Relievers Adam Ottavino and Aroldis Chapman. Along with the Red Sox, the New York Yankees carry an impressive stacked roster. Toronto Blue Jays: Ever since the Toronto Blue Jays broke down their roster after their 2016 postseason run, the Blue Jays have been bad. The loss of Josh Donaldson, Jose Bautista, and Edwin Encarnacion destroyed the team name. Now in 2019, the Blue Jays enter a year of rebuilding their roster. The future is bright in Canada by the MLB’s top prospect in Vladimir Guerrero Jr. and Toronto’s young stud Lourdes Gurriel Jr. The 2019 Opening Week has been what they looked forward to. The Blue Jays front office do not expect much from this years team besides the franchise rebuilding itself to compete in the near future. Some names to keep in mind for the maple leaf country are Outfielder Randal Grichuk, young stars Alen Hanson, Socrates Brito, Teoscar Hernandez, Vladimir Guerrero Jr, and power hitting First Baseman Justin Smoak. The Blue Jays lack in starting pitching and should invest their money in their rotation and bullpen. The 2019 season will be similar to Baltimore’s where it will go downhill in the next couple of months with the tough competition in their division. Cleveland Indians: The Cleveland Indians are a very interesting team for 2019. For many past seasons, the Indians have had a very successful regular season until getting to the postseason. The Cleveland Indians have choked many runs at winning a World Series. Being the best team in the AL Central, the Indians have an easy division to win meanwhile having an all around balanced team. In 2019, the Indians look to repeat from their previous success but wish to come out triumphant at the end. As long as the Indians have Jose Ramirez, Francisco Lindor, Corey Kluber, and Trevor Bauer, they will remain in being the best team in the division. Starting off the 2019 season, the best hitters for the Indians have been Carlos Santana, Tyler Naquin, and Hanley Ramirez. Opening Week was nothing but smiles for the team. Although they are not leading their division, they are destined to be back on time meanwhile competition slows down and the division becomes cold once again. Some names to keep in mind for the tribe this year should be, Third Baseman Jose Ramirez, Pitcher Corey Kluber, Shortstop Francisco Lindor, and Pitcher Trevor Bauer. Although the Indians should win their division, they will not go far in the 2019 Postseason with the American League being difficult. Detroit Tigers: The Detroit Tigers have slowly and slowly faded away as being a competitor in the division. After the 2012 World Series run against the Giants, the Tigers began to trade away their top franchise players for prospects. After losing Justin Verlander, Max Scherzer, Prince Fielder, and a healthy Miguel Cabrera, the team has yet to be the same. Until now beginning the 2019 season, the team is showing a sign of life. The Detroit Tigers finished Opening Week in first place in their division What has helped the Tigers thus far has been their starters. Two of the most surprising names that have lead the team has been the veterans Tyson Ross and Jordan Zimmerman. The two starters have been lights out even though they are ageing among the years. Although some bats have been cold, the most consistent hitter of the team has been Nicholas Castellanos. Nicholas Castellanos’ name has been tossed around in the trade market and in the following free agent market in 2020. The right fielder has hit for power and has shown his versatile in the outfield and the infield. One of the biggest wishes for the front office is that their franchise player, Miguel Cabrera, may be healthy and continue his monster career. The Detroit Tigers are in a state of rebuilding their franchise and will most likely not be a serious contender for a couple more years. Minnesota Twins: The Minnesota Twins always seem to find themselves in a hot stretch, but fail to win their division and fail at making the wildcard. The 2019 roster for the Twins is very underrated. The Twins are an all around balanced team besides their bullpen. Their line-up can produce many runs with many players who are well known for their power. The offseason acquisition of veteran Designated Hitter Nelson Cruz has helped the team succeed in 2019 as he is batting above .300 with all eyes on him. Besides Cruz, the light and soul of the team has been Catcher Willians Astudillo. Willians Astudillo has been the most surprising player on the team this year. Baseball fans saw a preview of what was to come at the end of the 2018 season as Astudillo was well known for the big-hefty runner who hustled from first to home on a ball to the gap. Beginning the 2019 season, Astudillo is batting .500 as being the best hitter on the team. Another player on the team that has had many expectations for multiple years has been Centerfielder Byron Buxton. Buxton has been on the radar to have a breakout season that may be comparable to the Anaheim Angels Mike Trout. Besides their lineup, one of their notorious pitchers has been the young Jose Berrios. Berrios has been the best pitcher in the Twins franchise since Bert Blyleven and Walter Johnson. The Minnesota Twins ended Opening Week above .500 at a successful series against the Indians and the Royals. Looking ahead to the future, the Twins will have a good season but the team has many injury prone players which will affect them chasing winning their division. Chicago White Sox: The White Sox are the lesser important baseball team in Chicago as the Cubs take the spotlight in the windy city. The Chicago White Sox have been in a state of rebuilding their franchise for multiple years. As the White Sox traded away Chris Sale to Boston in 2016, they received back one of the biggest prospect packages in MLB. Returning in this trade was top-prospects Second Baseman Yoan Moncada and Pitcher Michael Kopech. Since then, the White Sox have gathered kids from around baseball that can help them succeed in the future. The top White Sox prospect in 2019 is Outfielder Eloy Jimenez that is projected to be a future star this year and possibly win the Rookie of the Year Award. The beginning of the 2019 season for the Chicago White Sox has been what the Sox are used to, disappointing and heart wrenching. The only player on the roster who has been on a tear has been their Shortstop Tim Anderson and Second Baseman Yoan Moncada. 2019 is going to be a long year for the Chicago White Sox facing tough American League teams for 162 games in the year. Kansas City Royals: Remember when the Royals were in the World Series in 2014 & 2015, neither do I. As crazy as it sounds, the Kansas City Royals were once good. For the 2019 season, the Royals are going to struggle as they do not have that one banging bat that they can rely on. Their two consistent hitters are Whit Merrifield and Alberto “Raul” Mondesi. The upside of the Royals is that they are going to be one of the fastest teams in the MLB and are most likely to break a record in stealing bases. With the offseason acquisition of Billy Hamilton, and having Merrifield and Mondesi, the Royals are going to steal many bases. One of the major impacts the Royals had beginning their 2019 season was losing their All-Star Catcher Salvador Perez for the season. Salvador Perez is known for his amazing defense and ability to perform with runners on base. The Kansas City Royals lack in hitting and pitching. Their starters are one of the worst in the MLB besides the Baltimore Orioles. The Royals are not going to perform well in 2019 and are most likely to finish last in their division. The front office has low expectations for the team this year as they should tank against their opponents. Houston Astros: The 2017 World Series Champions had a tough stretch in the 2018 postseason which led them to be eliminated by the Boston Red Sox. The Astros are a really good ballclub all around the field. Although their start to the 2019 season has not been good, the Astros will find a way to be back on top. The 2019 roster has All Stars and MVP caliber players all around the team. Beginning with their lineup, with players such as Jose Altuve, Alex Bregman, George Springer, Carlos Correa, and newly signed Michael Brantley. All these names have been on the big stage before and are experienced players that are ready to win. Their one-two punch in their rotation are both always mentioned when talking about the CY Young Award voting at the end of the year. Justin Verlander and Gerrit Cole are two candidates in being the best pitchers in the American League. The one question mark is if their bullpen is strong enough to maintain games for their starters. In previous postseasons, the Astros bullpen has been terrible which was the reason why they were eliminated quickly by the Boston Red Sox. Their good bullpen arms consist of Roberto Osuna, Chris Devenski, and Hector Rondon. Those three players will not make the job done and will they will most likely be on the injured list halfway through the season. Even though the Houston Astros are currently begging their season in second place in the AL West, they will win their division at the end of the season and will compete in the postseason. Oakland Athletics: Moneyball and Billy Beane is what someone thinks about when they hear about the Oakland Athletics. The Athletics have shown that they are ready to compete and that they can prove themselves in a tough and competitive division. The Athletics have high expectations entering the 2019 season as they expect to be in the running to win the division. The Athletics are well known for having two of the best defensive players on their roster. Third Baseman Matt Chapman and Outfielder Ramon Laureano are Gold Glove caliber players that express the love and passion for the game on the field. Besides being defensively good, the A’s also have two of the best power hitters in baseball. In 2019, Khris Davis and Matt Olson are potentially both going to combine in hitting more than 60+ home runs as in 2018 Davis hit 40 home runs and Olson hit 29 bombs. One of the issues that the A’s have is their starting rotation. Last year their best starter was Sean Manaea who grew exposure from tossing a no-hitter. But beginning Opening Week, things are different in their rotation because they are giving up more runs than they usually do. Besides their rotation, their bullpen is very strong. Their bullpen includes one of the best closers in the game in Blake Treinen. Blake Treinen had a breakout year in 2018 and has high expectations for 2019 to repeat his previous success. The Oakland A’s are ready to contend but are not going to make it into the postseason with many teams in the AL that have reinforced their ballclub & franchise to be stronger than opponents. Seattle Mariners: Entering 2019, the Seattle Mariners were seen to be one of the worst teams in baseball. Baseball fanatics were completely wrong and the Mariners have caught everyone by surprise. Opening their season in Tokyo and continuing Opening Week completely owning their competition, the Mariners are surprisingly very good. The saddening thing about their season opener was the retirement of the great Ichiro Suzuki returning for the last time in professional baseball activity to his hometown. After the Seattle Mariners ended their 2018 season, the Mariners traded away James Paxton, Jean Segura, Robinson Cano, Edwin Diaz, and Alex Colome. Seattle was expected to be in a state of rebuilding their franchise and start from scratch. Instead, they loaded up their roster with players from packages they received from trading away their many pieces. Over the offseason, they signed one of the biggest names in Japanese baseball in Yusei Kikuchi who is beloved in Japan. Beginning Opening Week the Mariners caught the league by surprise. Leading the Mariners were players who are underrated, such as Tim Beckham, Daniel Vogelbach, Mitch Haniger, Ryon Healy, Domingo Santana, and Edwin Encarnacion. Currently, the Mariners are in first place in the AL West. The Seattle Mariners are going to be one of the better teams in the American League and are going to make the postseason in 2019 for the first time since 2001. Los Angeles Angels: The Los Angeles Angels of Anaheim are an odd team to talk about. The Angels have the best player in baseball on their team in Mike Trout but are a joke of a franchise. Many can argue that the Angels are wasting Mike Trout’s career. The Angels are going to have a difficult time in trying to compete in their division with the stacked Houston Astros team. Over the offseason, the Angels signed Justin Bour, Ian Kinsler, Jonathan Lucroy, and Cody Allen. The front office desires to have a strong season from these acquisitions because they have had years where they burst onto the scene bringing it their all. Beginning their 2019 season, the Angels are a decent ballclub. The team has two key players on the Injured List that can help the Angels be a better team. Two-way player Shohei Ohtani and Justin Upton are currently injured and are destined to return sometime later in the season. These two key bats are missing pieces in the lineup that is shakey. Players like Kole Calhoun, Zack Cozart, Albert Pujols, and Andrelton Simmons need to start to get productive and consistent to produce runs for the team carried by Mike Trout’s success. Over the offseason, Mike Trout signed an extension to his contract for 12 years and earning $430 million, the largest deal in American sports history. The 2019 season for the Angels is going to be tough. It will always be a great show watching Mike Trout continue his marvelous career and awaiting Ohtani’s return from Tommy John Surgery. Texas Rangers: After losing the great Adrian Beltre to retirement, many fans believed that the Rangers will never be the same entertaining team they once were. Ranger fans should look forward for what’s to come in Texas in 2019. One of the most entertaining players to keep an eye on in Texas is going to be Joey Gallo. Last year Gallo hit 40 home runs but had a shocking 207 strikeouts, almost breaking the most strikeouts in a single season. Over the offseason, the Rangers picked up veteran Outfielder Hunter Pence. Hunter Pence had a declining year his last season with the Giants as age is becoming an issue for his liability. For every major leaguer, there comes a time where being human comes into effect which damages their chances of being good. Another player to look forward this year in Texas will be reliever Jose Leclerc. Jose Leclerc has a breakout season in 2018 which led him being one of the best relievers in the American League last year. Besides these three pieces, the Texas Rangers have much talent on their active roster. Some names to look forward playing in Globe Life Park in Arlington should be the loved Elvis Andrus, Rougned Odor, Shin-Soo Choo, Nomar Mazara, and Delino DeShields. As a repetitive topic in the AL, there are usually the top dog teams in their divisions. The Texas Rangers will have a struggling season in 2019 as they began nor good or bad. But in a very hard division being in AL West, the Rangers will not finish on top. The Dodgers this year are looking to enter into the World Series for a third straight year after just a horrible outing in the World Series last year. The Dodgers will be lead by a strong starting pitching staff headlining Clayton Kershaw, Rich Hill, and Walker Buhler. The offense has also shown a lot of promise as the team will get back Corey Seager who has been an established leader on the team. The Dodgers have also added free agents AJ Pollock and Joe Kelly both players who should provide a lift to the team. Finally, the Dodgers bullpen/starting pitching this year should be much better than last year as the team has several pitchers on the bubble of starting, and being in the bullpen. These pitchers include, Kenta Maeda, Julio Urias, and Ross Strippling all players who have proven to succeed in both positions. Welp the Phillies did it they landed the big one with Bryce Harper. Harper will look to make a huge impact on the phillies as he stated in his first interview with the team that it’s time to bring a championship home. The team also added Andrew mccutchen and JT Realmuto. All three of these players will more than likely have huge impacts on the Phillies. The Phillies in my mind are the heavy favorite to win the division. The Phillies also will be lead by the dynamic duo of Aaron Nola and Jake Arrieta. With all the adds for this team, and finishing on a hot note last season expect to see them make a deep run in the playoffs. The National league central has potential to be the most competitive division in the league this year. My Pick are for the Brewers to win as they will be lead by Christian Yelich. The team also has such a strong bullpen that it should invoke fear in teams everytime that they look on their schedule and see the Brewers name on there. The Brewers were also able to bring back Mike Moustakas who will look to have a bounce back year after a sad performance in the playoffs last year. The Brewers also added former Dodger Catcher Yasmani Grandal. Finally expect to hear the name Josh Hader a lot. The man has one of the weirder releases in baseball, but is just so good that every team should be afraid. As the NBA Season winds down, it is safe to say that many teams are disappointed in their overall performances. Is this a trend in professional sports as a whole? Can it be that it no longer becomes about the monetary backing teams have to build a dynasty? How does it affect us here at home? With just two days left in the regular season, here are some – but not all – examples of where some of the outlying teams (out of California) are at today with the field at-large. The Charlotte Hornets, Detroit Pistons, and Miami Heat all are jostling for the final playoff spot in the Eastern Conference. These last two days will bring one of these three into the playoffs, and two fishing. So, all across the nation, uncertainty and hopes on the hits and misses of opponents, what is happening (or not) at home? The Los Angeles Lakers will not be in the playoffs this season, for the fifth straight year. It is safe to say that the acquisition of LeBron James, at least temporarily, re-invigorated a loyal, but disillusioned, Lakers fan base. James is a dynamic player and a force to be reckoned with on and off the court. Early indications were positive and, a there was a hope that he had taken a mentoring role for Lonzo Ball, Brandon Ingram, and other young players on the team. As an aside, there were several shout-outs to encourage the James family to send their son – Bronny – to St. John Bosco next year (just sayin’). Obviously, the team, even with James, fell short of expectations. Is it fair to say that the Lakers, rather than depending on the glory of the past, firmly have to embrace a reinvention of the Lakers brand? Those of us whose parents (mine especially) who lived and breathed Magic Johnson and the Buss family dynasty are having to take a step back and question what the Lakers can, and will do to bring back the magic of this historic franchise’s dynasty. It will be interesting to see what happens upon the season ending. Will it be front office decisions, and is that really what this team needs? Will Luke Walton be gone? Will LeBron still be a Laker next year? Basically this season has, again, left us with more questions than answers, for Lakers fans especially. Back to the larger landscape, the playoffs – or teams in it – are essentially set in the Western Conference. The playoff seeding looks like this in both conferences with two days left. We’re shaping up to have another tremendous year of NBA Playoff basketball. The young and hungry St. John Bosco volleyball team is ready to attack the fast approaching 2019 Trinity League season, looking to build on their previous productive season under new head volleyball coach Shane Beatty. “We’re looking to bounce back from a down year, placing fifth in league. We want to improve that position significantly, and we have a good group of guys that are getting after it every day,” said the newly appointed Beatty. 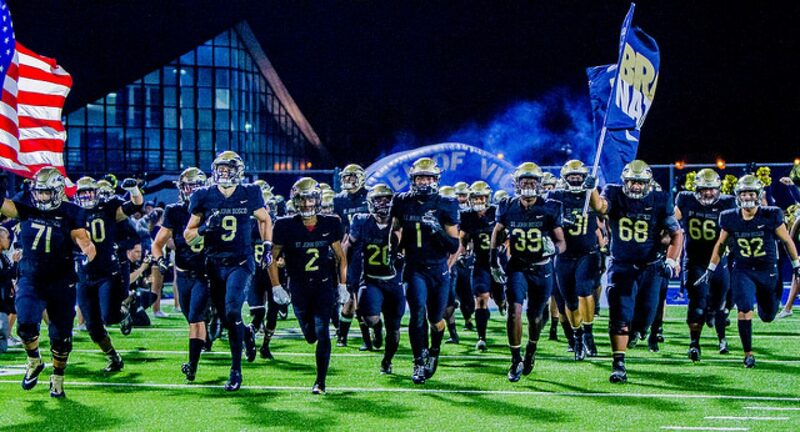 The Braves finished in the bottom half of the Trinity League last year but showed spurts of phenomenal play, which Coach Beatty intends to capitalize on, and make the precedent for this year. “The guys have been in the gym almost every morning before school, working and pushing to try to improve and perfect the little things,” explained Beatty. Coach Beatty comes from a long history of volleyball, from previously coaching at Hope High School, to still currently coaching with Rockstar volleyball club, one of the premier clubs for high school volleyball in the Los Angeles area. The players seem to have completely bought in and invested in their newfound coach. With high energy and a strong mindset, they are prepared to put in the work it takes to hopefully achieve their dreams of becoming Trinity League champs and having a successful season. “He’s really energetic and focused on improving [us] players from the ground up,” said junior player Elijah McCray. The young team looks to follow in the footsteps of senior leaders Samuel Rodriguez and Parker Gray, who have been around the program for multiple years and are eager to finish their senior seasons on a high note. “Sam and I have been in this program for some time now, and we are excited to finish our high school careers with our Bosco brothers on the highest note possible,” said senior Parker Gray. A consistent spark for the braves has been junior Alex Rotter, who currently leads the team in kills and is playing at a very high level. Currently, the Braves sit at 12-13 with some very credible wins over great competition, and the team is confident they will head into league with a good head of steam. Trinity League begins tomorrow, March 15th as the Braves take on the JSerra Lions. The players feel confident and are prepared for the upcoming battle. Don’t miss out on the start of what is to hopefully be a fantastic season for the 2019 St. John Bosco volleyball team. Sports: Is Draymond Green Holding Back The Warriors? The Golden State Warriors seem to be on their way to an easy three-peat, but will their chances of making history be thrown away by a single player? Some people wonder if Draymond Green is more of a blessing or a cancer to the Warriors. The Golden State Warriors are the popular pick for winning the 2019 NBA Championship, considering they signed another All-Star, Demarcus Cousins, to their already loaded team. Before Cousins, the team already consisted of four All-Stars, Klay Thompson, Draymond Green – and two former MVPs – Stephen Curry and Kevin Durant. Currently, the Warriors are the number one team in the Western Conference with a record of 45-21. Although the team has been playing well, there have been many arguments and problems between players and coaches that have occured recently. Consistently, Draymond Green seems to be always a center of these troubles. The incident that sparked this debate was between Green and Kevin Durant during a close game against the Los Angeles Clippers. In the final seconds, Green had the ball and would not pass it to Durant, which really angered him. During the timeout, Durant made it clear to Green that he should have passed him the ball allowing him to score in the final seconds. The Warriors ended up losing this game to the Clippers in overtime, 121-116. The most recent altercation between the Warriors was between no other than Draymond Green and head coach Steve Kerr. During a tough game against the the worst team in the Western Conference – the Phoenix Suns – Kerr expressed his frustration with Green. In the end, the Warriors would lose an extremely disappointing game to the lowly Suns, 115-111. With Draymond Green being a free agent after this season, many wonder if the Warriors will sign him back to the team. To many, it seems like Green is messing his chances up at getting a better contract in an offseason he expected to earn big money.